A challenge that faces low water usage gardeners during the dog days of summer, where rainfall is sporadic, is how to add color to your garden when your plants want to go dormant throughout these hot, dry days. 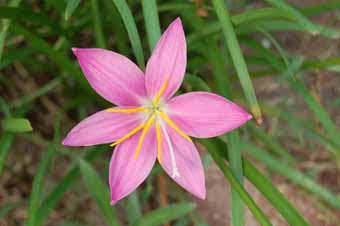 One solution I have found are rain lilies of the genus Zephyranthes. These hardy bulbs send up flowers when the weather is hot and a passing summer shower temporarily brings welcome relief from a dry spell. Their flowers range from a larger pink variety to crocus like blooms of peach, yellow and white, with the white ones being the smallest. The pink ones are usually the first to send up buds, followed soon by the others to create a riot of cheery color. This delightful burst of color lasts from a couple of days to a week depending on the weather conditions. Rain lilies will develop into larger clumps as the bulbs naturally divide. If you let the seed heads mature, they will also propagate from seed. 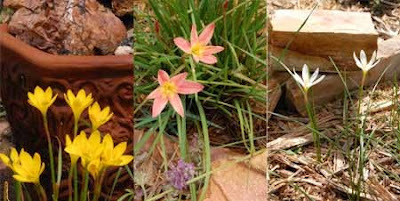 An interesting note, when the pink rain lilies reseed, they produce the smaller bright yellow rain lily. All of the others seem to come up true from seed. Therefore if you want to share your pink rain lilies, you must divide the bulbs. When rain lilies are not in bloom, their strap like leaves provide a spot of green. If you have a particularly long dry spell, these grassy clumps may almost disappear. The foliage will also disappear with a frost and then reappear as the weather warms in the spring. Plant Zephyranthes and you will be treated to treasure chests of colorful jewels gracing your garden shortly after you are lucky enough to catch a summer shower. I enjoy going to museums and galleries to look at well designed and executed “art”. I use this term to include everything from furniture to paintings to jewelry and home décor, to name a few categories. This week I came across a reference for an online photo gallery of great objects. No need to drive, find a parking place or buy a ticket. You will find awesome photos of wonderful items in a variety of categories. If you also enjoy window shopping, you’ll enjoy this site. In addition to being a really fun site to poke around on and look at all the pretty things, you can also submit your own photos of neat things. I have had two of my item photos accepted so far. CraftGawker is a spin-off from the FoodGawker gallery. If well cooked and well presented food is more your thing, then find a feast for your eyes at this website. Happy browsing. There is a place on Etsy where you can request a custom item from any talented Etsian that responds to your request. It is called alchemy. As I scanned the alchemy requests one day, I came across an interesting one for “Mother – Daughter Jewelry”. The requester wanted something that both she and her mother could wear to remind each other that they were there for one another in spirit, even when they couldn’t be in person. I had recently made a necklace and earring set that I thought might interest this person. I set out to locate crystals in the colors of the birthstones of the five women from her family that were to be represented, as well as the sterling silver chain and findings that were a requested upgrade to my original bid. 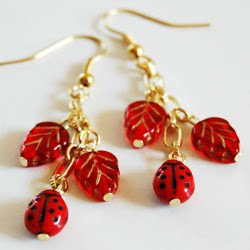 My customer coordinated having the charms shipped straight to me, as we were on a tight schedule due to her upcoming move to attend graduate school. When I finally had all of my materials, (Some arrived a day later than I had anticipated!) I gathered them all in one place and began assembling the crystal sections. When those were all finished, I clipped the sterling chain into sections of the needed lengths. The challenge here was to make two different lengths of bracelets look as close to identical as possible. 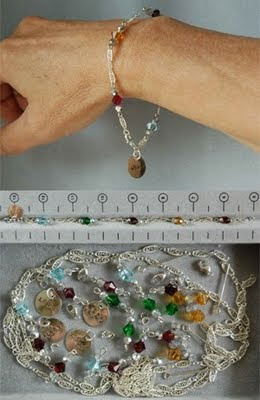 I laid out all of the components for one bracelet at a time on my beading board and then assembled each bracelet. With the bracelets completed, it was time to take some photographs to send to my customer for approval. She was pleased, so each bracelet was placed in its own gift box and then they were prepared to be sent by priority mail. I’m happy to say that they arrived in the knick of time and the gifts were well received. Storms, disease, drought, they all take their toll on our trees. Often when a tree or a portion thereof needs to be removed, it winds up in our landfills. Some communities and tree services have realized that this is a huge waste of resources and have begun chipping this material and composting it for mulch. Unfortunately, many times the chips wind up in landfills too. Much of this wood could be turned into useful items if it could find its way to the right person. I had a sycamore tree die from a recent drought. It was nice wood, so I’m having the main trunk planked to panel a wall. I had my tree service leave the smaller pieces as well because it seemed a shame to not do something with all of that pretty wood. I have begun to make some home décor items from this sycamore wood. The first item I made was a wall clock. I cut a ¾ inch slab from a limb and sanded it. I then applied several coats of a clear stain and sealer to bring out the beauty of the wood. Now to add the guts of the clock. Some battery powered clockworks can be a little on the noisy side, however I used a brand that is very quiet. I have used this brand in the past to replace distracting ones. To the clockworks I added decorative hands and numbers for the clock face. 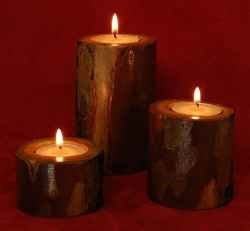 My next projects were a set of tealight candle holders, business card holders and pen blanks for wood turners. For the candle holders, I drilled a hole in one end of a length of limb of the proper diameter for a tealight to fit into. I sanded and finished each of the three candle holders of the set as I had the clock. Next, came the business card holders. Earlier this year I attended a conference and needed something to place my business cards in. Again my sycamore wood was used to created pretty, useful items instead of rotting in the landfill. I have a few other items that I have started as well. I am working on some desk sized business card, pen and pencil holders as well as a rustic wooden vase to hold dried or silk flowers. It’s looking like I may keep the prototype of the vase, I like it so much, so I’ll have to get busy on a second one for my shop. I have accomplished all of these recycling projects with basic shop saws, a drill and a sander. Next time you see a downed tree, maybe you can take some home to make your own creations or turn a woodworker in your area onto it, so it doesn’t just get hauled off to the landfill. To see what recycled wood home decor items that I currently have for sale, please check out my Feathers, Leather n Wood shop section.